We use IFS/FEDEX and Royal Mail for our deliveries. As we ship to most destinations in the UK and Ireland, delivery charges vary and are calculated at time of order. We have kept all charges to a minimum. What is the delivery pricing? The below list covers most destinations but if you are in any doubt please email us for clarification. We apologise that we are unable to offer free delivery to Highlands and Islands. Unless stated differently in the description of each product, all goods are shipped out on 48 Hour ( 2 working days ) delivery and can be booked up until 1pm for same day despatch. We despatch Monday - Friday. Please note this is a 2 working days delivery facility. Orders despatched on a Monday should arrive on a Wednesday. Orders despatched on a Thursday should arrive on the following Monday. Orders despatched on a Friday should arrive the following Tuesday. Express Service (24hrs) is available at an extra cost (£12 per box) and if you need details please contact us using the information below. How can I track my order with IFS/FEDEX? It's very simple. IFS will use the same E-mail address that you have used when placing an order. When your order has been dispatched, you'll receive a confirmation e-mail from Kids Store letting you know that the goods are about to leave us and details of the courier consignment number, along with a link to the couriers tracking facility. For your extra assurance we also ask our couriers to send you an email confirmation and tracking link. After that, you will also receive an email from IFS when the goods have been collected by them as well as an email when the courier is out for delivery. From there you just need to follow the hyperlink supplied in their email to you to their website, or track manually via the consignment number again supplied in their email to you. Below is a sample screenshot from an order that is out for delivery. 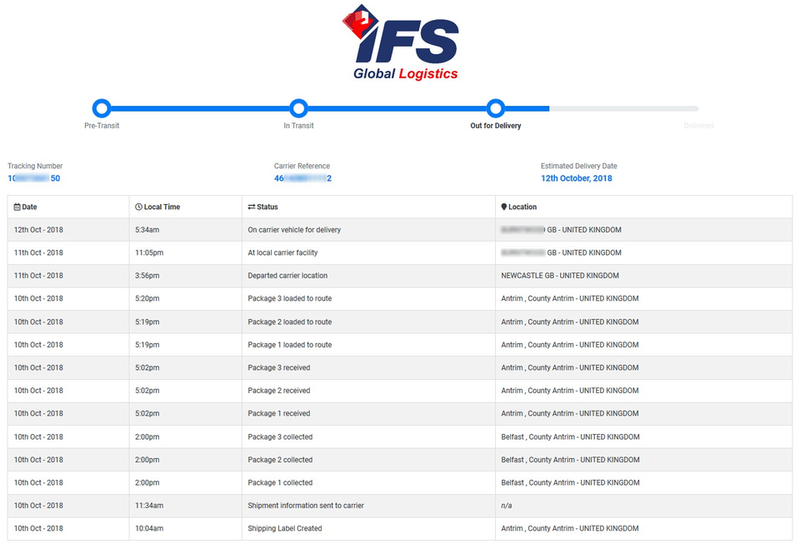 You should be able to see something similar when we ship your order with IFS Courier. Kids Store have despatched your shipment with IFS Courier Express.